Savannah Happenings Community portal goes live ! 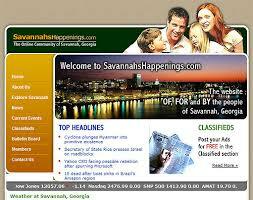 The site www.savannahshappenings.com is owned and operated by Roy Newsome Enterprises located at 3928 Ogeechee Road. Uncle Roy as Mr. Newsome is known fondly in the community, has created this website for users to share their opinions about their community and interact with each other. The site provides for a user-friendly bulletin board system in addition to offering free access to community events, news, weather information and stock prices. If you wish to learn more about Savannah, GA, there can not be&nbsp; better place than www.savannahshappenings.com.